When the sunny spots in our woods are carpeted by the nodding yellow flowers of the trout-lily, Erythronium americanum, it is a sure sign that spring has arrived in central New York. As its name suggests, these lovely spring wildflowers are members of the lily family, Liliaceae. They like rich woods and are typically found growing in extensive colonies consisting of hundreds of plants. Most plants will be flowerless, but the leaves themselves are attractive, having reddish-purple and lighter green blotches against a dark green background. The plants are small, generally two to ten inches in height. In rich soils, you tend to find fewer and larger plants. In poorer soils, you tend to find more and smaller plants. The flower is large in comparison to the plant, being an inch or so in width. It has three reflexed sepals and three reflexed petals. The backs of the sepals may have a reddish-purple tinge. Erythronium americanum goes by many names. It is called "adder's tongue" probably because its leaf resembles that of a tiny fern called adder's tongue, Ophioglossum vulgatum. Another common name is "dogtooth violet". 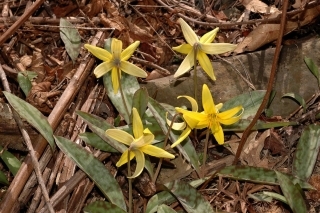 The plants, but especially the leaves, resemble the European species of Erythronium, which is Erythronium dens-canis. The European species has flowers that are pink-purple colored and so it is called "dogtooth violet" even though it is not a violet, botanically. "Dogtooth," I think, refers to the appearance of the corm. The naturalist, John Burroughs, coined the term "Trout-lily," probably for the speckles or blotches on the leaves that resemble the markings of many kinds of trout. 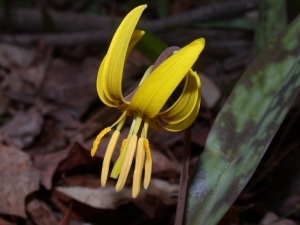 There is a related species with white flowers, Erythronium albidum, which is found west of our area in the midland states. There are several records of it scattered throughout upstate New York including the nearby Chenango County (ref 2). It does not occur in the Ithaca area. It is found in Western New York, but it is uncommon (ref 4). Weigand and Eames do not list the white species at all (ref 3). 2) Personal communication with Anna Stalter, Bailey Hortorium, Ithaca, NY.